The temple attracts pilgrims throughout the year. 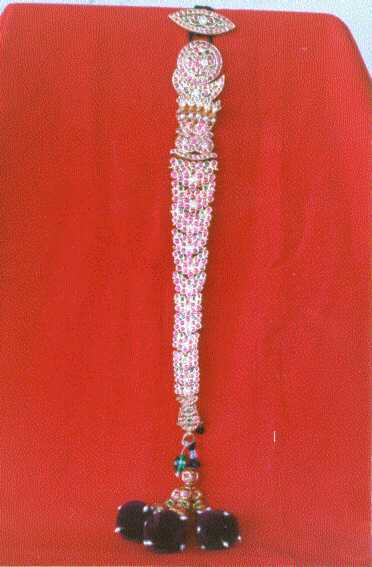 Ramanavami is celebrated every year in a grand manner in the months of April/May. 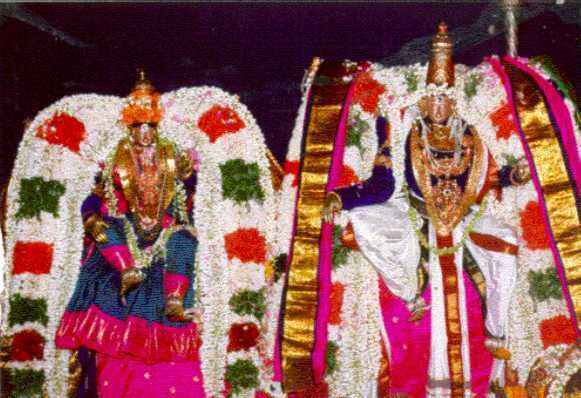 Thirukalyanam and Kanakibishekam are the two important events in Ra manavami festival. 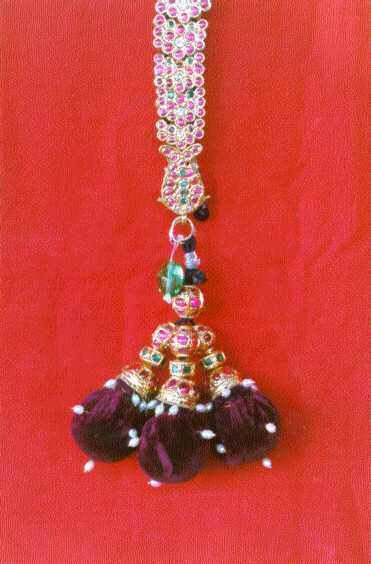 Thayaar always goes with perumaal in all purappaadus; they are never separated. On Sravanam day the "sravana deepam" is taken by a divine person on whom it is believed the Lord will prevade at this time of deepam. He will carries the deepam around the temple as lead by two other deepams - one is vaal deepam of aanchnEyaa and the other is satti deepam of Lord Narasimhaa. 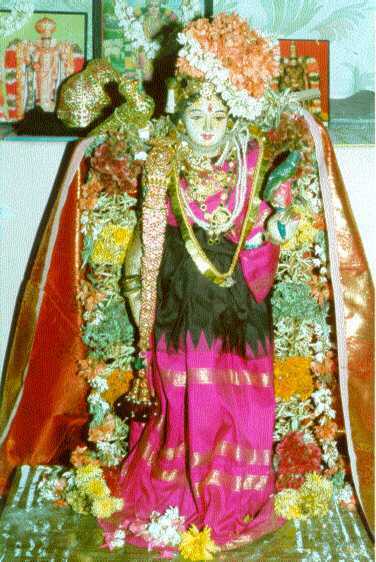 Numerous devotees from all walks of life wait for this event on Sravanam day as they ask the Lord (ie the main deepam bearer) anishta nivartthi for their proble ms and boons for their penances. No science can reason this experience as this has to be sought and felt by one. One has to see this deepam sEvai to appreciate the majesty of this Lord's prevasion. There are few other temples in this area such as thErezhu ndoor temple where also the sravana deepam is observed. 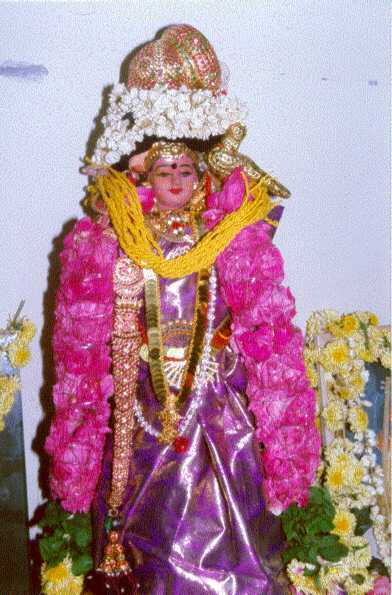 Since a unique relevance to this Lord and Lord Guruvaayoorappan exists, this Lord is also dressed on some days as Guruvaayoorappan and bakthaas offer "thulaabaaram" to this Lord, also as for Sri Gu ruvaayoorappan. Note: Many of the sevas require reservation in advance. Please call the temple office directly and confirm the suitability of dates and the cost. The following table lists the details of the various rituals performed at the temple as well as the timings and rates. 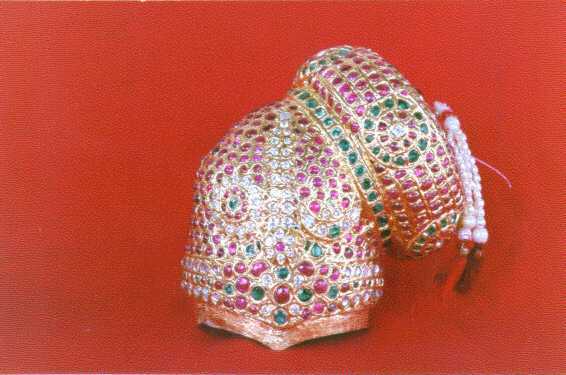 Many BhakthAs of Sri Bhumi Devi Sametha Sri Oppiliappan raised funds during 1997-98 to offer special AbharaNams for Sri Bhumi Devi during the occasion of the forthcoming KalyaNa Uthsavam in the month of Iyppasi , BhaudhAnya Samvathsaram (October 29, 1998) .This kaimkaryam is part of the series of Kaimkaryams that consisted of the SamarpaNam of RathnAngi for Sri Oppiliappan Uthsavar and Mutthangi for Sri Oppiliappan Moolavar during the August of 1996 and the Rathna Kireetam for the Uthsavars during 1976. BhakthAs of Sri Bhumi Devi sametha Sri Oppiliappan are all invited to participate in this kaimkaryam and obtain the blessings of the Lord. 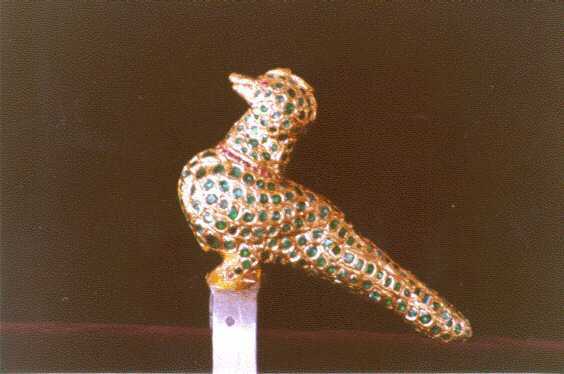 During this year's KalyANa uthsavam, MaNNickka Kondai ( Ruby Crown ), Maragatha KiLi ( Emerald Parrot ), and Jatak Kothsu ( Jewelery for the pinnal of our ThAyAr ) along with Mutthnagis for the divya dampathis will be presented by the GodhA Priya Kaimkary a Committee of Chennai. The six images of the AbharaNams depict the MaNNickka Kondai (Mangayarkkarasi Kondai ), Emerald Parrot (marakatha KiLi) and the Navarathna Jata Kothsu with the symbols of the Sun, the Moon, and the N aagams . We invite you to have the sevai of these AbharaNams adorning a Kolu Bhommai of Andal, who is the incarnation of Bhumi Devi . 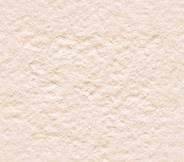 Further, we also invite you to take part in the AbharaNam SamarpaNam celeb rations on October 29, 1998, at the Divya Desam of Sri Oppiliappan Koil. Please contact Sri V. Sadagopan, Scarborough , N.Y., for further details.